Available at Sephora (in-store and online) and on the Urban Decay website. 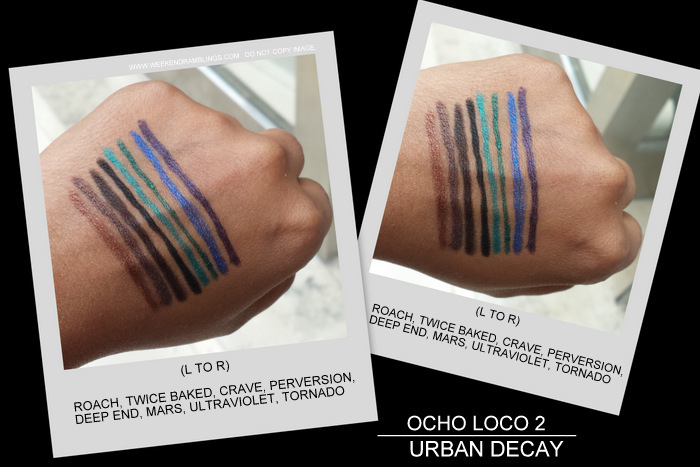 Urban Decay 24/7 eyeliner pencils are one of my favorite makeup products, so I just had to check the two new pencil sets from Urban Decay - Black Market and Ocho Loco 2. 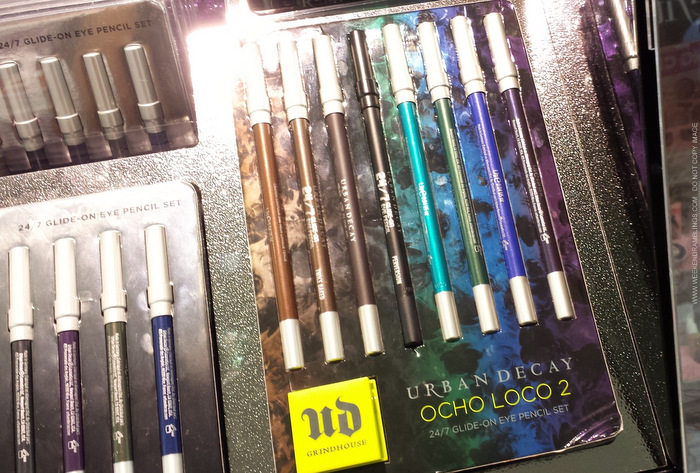 The sets feature a mix of older shades from the brand along with a couple of new pencils. Here's a look at the photos and swatches. Like the most illicit of substances, our 24/7 Glide-On Eye Pencil Sets have been known to provoke some pretty insane behavior in fans eager for another fix, and Black Market is no exception. The smoky lineup includes a deep inky-blue shimmer, a glittery grayish-purple, and a cool black satin (because one shade of black is never enough). Get it now or risk having to resort to extreme measures to track it down later. “Ocho Loco” means “Crazy Eight” in Spanish, which sums up the shades in this sequel perfectly. Play it tame (but not boring) with edgier-than-average neutrals. Smoke it up with our deepest, blackest black. Experiment with trippy-cool acid brights. From returning faves like Deep End and Perversion to new, destined-for-cult-status shades like Ultraviolet and Mars, this set has it all. Comes with a neon-green Grindhouse Double Barrel Sharpener that is exclusive to this set. I bought all the regular Urban Decay eyeliners a while back, so I really wasn't all that very tempted to pick up either of the sets. 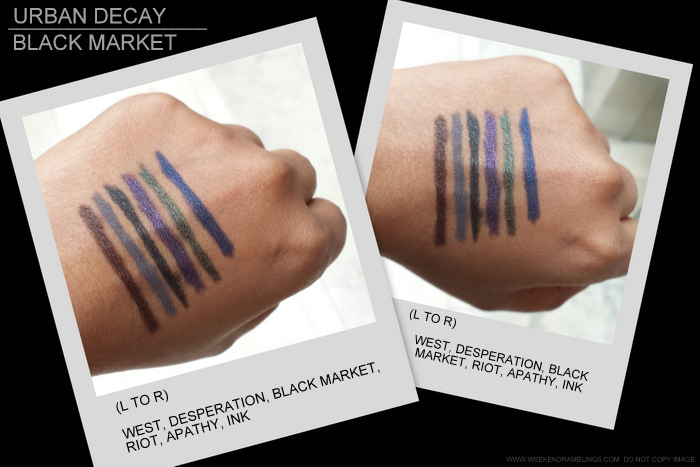 Between the two, though, I would pick Black Market - only because I haven't gotten much use out of any of the brighter eyeliners I have with me right now. 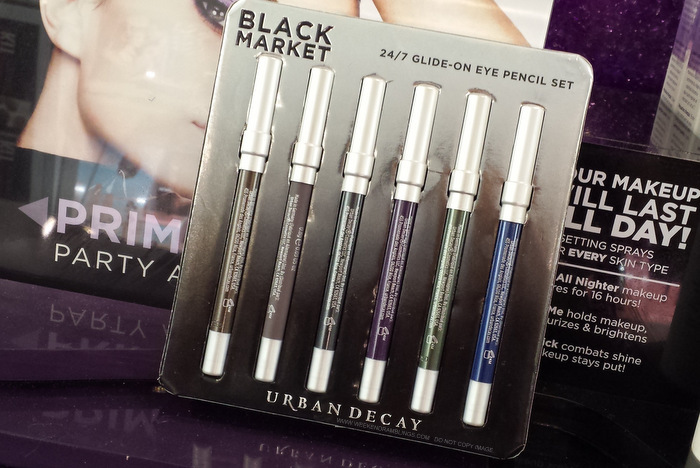 Urban Decay eyeliner pencils are some of the best eyeliners/makeup products I have tried so far. They are long-lasting, awesomely pigmented, and definitely do glide on the skin oh-so-smoothly. The shimmery/sparkly shades do tend to disappear faster than the non-shimmery ones. 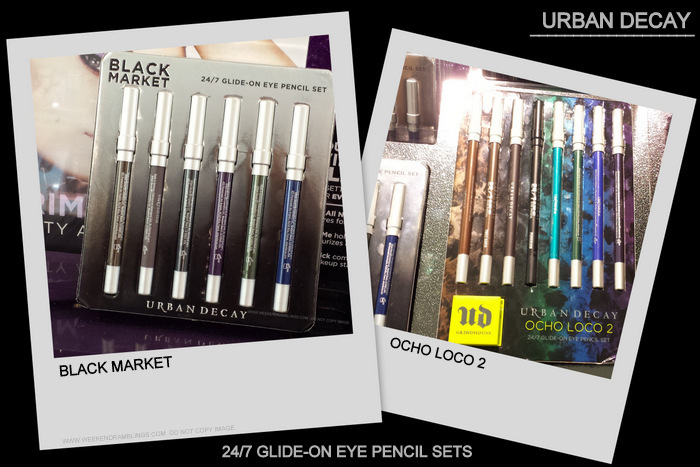 Both the sets are pretty good value for money and a nice way to try out a couple of the awesome UD pencil liners, especially with the Urban Decay 20% off sale going right now.